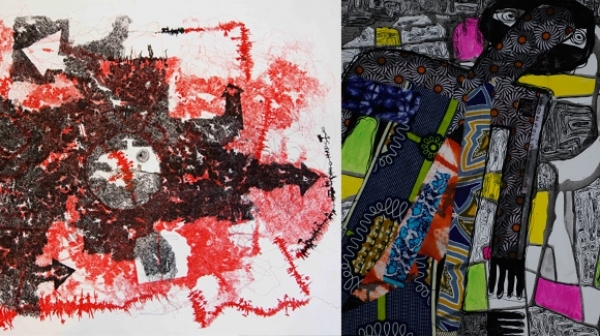 “Mediations” presents recent works on paper by Nigerian artists Uche Uzorka and Obinna Makata, two new contemporaries who are quickly becoming cornerstones of the burgeoning arts community in West Africa. Uche Uzorka and Obinna Makata are mixed media artists who live and work in Lagos. After attending the University of Nigeria, Nsukka, and working as practicing artists in Abuja together, both artists have recently undergone residencies at the African Artists’ Foundation’s Artist in Residency (AIR) program. In these new bodies of work, Uzorka and Makata incorporate similar practices using drawing and collage to comment on the vast changes occurring in Nigeria today, including urban development, the population explosion, and shifting cultural values. Uche Uzorka combines ink and charcoal drawings to reflect on the spatial dynamics of the developing urban center of Lagos. In his meticulous abstract works, Uzorka combines lines, amorphous shapes, and splashes of colour that flow together in a seemingly haphazard rhythm. At closer inspection, meticulous attention has been made to create a myriad of overlapping patterns, bodies, and signs, tightly congested together to form a dense combination of visual clutter. Seen from a distance, Uzorka’s drawings suggest an exercise in mapmaking or cartography, surveilling the cityscape from above. As the viewer focuses on the minute details, other associations allude to the individual’s experience in navigating the chaotic and vibrant urban street culture of Nigeria. Obinna Makata uses fabric as a metaphor for cultural identity and evolving social paradigms. His works create narrative associations that deal with quotidian issues in contemporary Nigerian society, including visa queues, modern relationships, and crowded urban environments. Crudely sketched with ink and acrylic, Makata combines scraps of Ankara fabric to form the bodies and backgrounds of his figures. Makata describes his collages as “broken pieces of African culture”, a response to the omnipresence of foreign influence that continues to threaten traditional value systems and artistic processes that are unique to the Continent. While both artists work with disparate motivations, their work aligns in visual style and conceptual concerns, with shared experiences binding their practice in dialogue with one another. Through the mediation of materials, processes, and cultural critique, Uzorka and Makata comment on the social fabric of daily life in the bustling and ever-changing megacity of Lagos today. Tuesday-Friday from 9 to 17 pm. Saturday-Sunday from 11 am to 17 pm. Closed on Mon- days. Accessible by tram 10 stop Azartplein, bus 48 from the station CS and Sloterdijk, bus 65 from the southern stations and Amstel.